The fashion house has done much to elevate the status of its business, but share prices are only just beginning to follow suit. Fashion retailer Coach (NYSE:TPR) is making a compelling argument that it is now on the mend. The iconic American company had a rough multi-year stretch starting in 2012, with its stock losing more than half of its value at one point. But after an overhaul of operations and with shares now sporting an attractive dividend yield, Coach looks like it could be a nice accessory in many investor portfolios. After posting a 4% and 16% year-over-year rise in revenue and profit, respectively, in its most recent earnings release, Coach shares are trending upward once again. As of this writing, the stock has gained over 8% year-to-date as holiday sales were solid despite challenges across the retail world. The most impressive part of the latest results: Coach delivered growth even though the company had a planned drop in department stores and wholesale. As a final part of its restructuring from the last few years, Coach is elevating its image by offering less promotional sales activity. In tandem with those efforts, traffic is getting pushed to its own stores where the company has more control over its brand messaging and themes. This new message, one that touts the company's identity as a "modern house of fashion" rather than a women's handbag specialist, is also resonating overseas. Total international sales were up 3% during the holidays. New flagship stores were opened in New York City and London, and Coach continues to post gains with mainland China's fast-growing middle class. Despite the recent advance in share price, the stock is still over 10% short of its 52-week highs. Part of that can be explained by headwinds from currency exchange rate losses (revenue would have been up 6% in China if excluded). Sales have also been partially to blame -- retail is cutthroat and seasonal with revenue gains coming in fits and starts, unnerving less patient investors. Broad strategic changes are starting to yield positive results, though, especially on the bottom line. After successfully cutting out heavy discounting from its model, the company has emerged with fatter margins, and top line gains are having a bigger impact on profits. Speaking of profits, Coach uses a substantial portion of its extra cash to reward shareholders, and the company's yield rivals some of the retail industry's dividend stalwarts. Data source: Company financial press releases. Table by author. 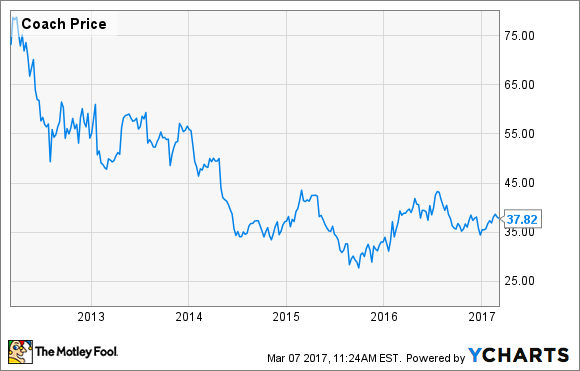 Coach hasn't increased its dividend since 2013, but it maintained the payout during the duration of its turnaround. In the meantime, the yield has gone up as share prices declined, making for a compelling payout to shareholders. One could argue that investors would be better served investing in a company that actually raises its dividend. Consistent payout raises often support an appreciating stock price over the long term -- I would argue that Coach could become just that type of company. 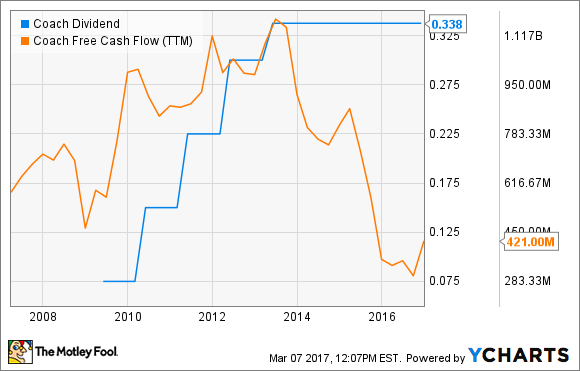 Prior to its fall from grace a few years ago, Coach was consistently hiking its dividend. However, as rebranding efforts became necessary and sales fell, free cash flow started to tighten. Following a significant decline, the company's free cash flow has begun to show signs of life. Should that metric keep rising, returning more capital to shareholders would be an option to management once again. Coach stock can be a great addition to any portfolio. Investors who appreciate a turnaround story have to like the company's extensive efforts to bolster operations and add meaningful growth to the bottom line, even while facing a difficult retail environment. And for those in search of income, the dividend would be a nice bonus and should remain stable (at the least) with a return to free cash flow growth.